Here is a good one for you, this soup takes around 20 minutes to make, is healthy and super tasty. Just how I like my recipes, quick, clean and damn good. Whip this up quickly after a busy work day or impress your guests with a fancy (but easy) appetizer. Yes, asparagus may make your pee smell, but they sure come packed with a healthy punch. These green stalks are full of antioxidants, which help fight free radicals in the body. 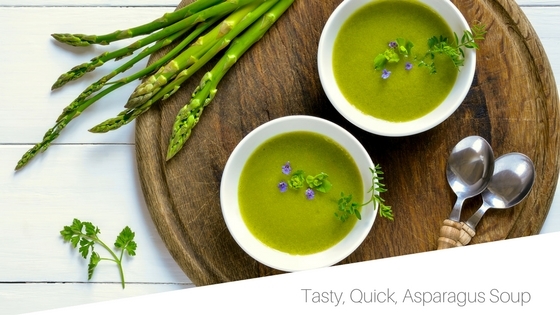 Asparagus are a good source of folate, fiber, vitamin E, K, A & C. Plus, they contain chromium, helping insulin transport glucose from the bloodstream and to your cells, creating energy. 1. In fry pan, over medium heat, coat pan with coconut oil. Add onion and cook for around 5 minutes or until tender. Then add asparagus, stock, turmeric, mint & thyme, stir well, cover and cook for another 5 minutes or until asparagus are done. 2. Here you can use either an immersion blender or high-powered blender. If using immersion blender, add all ingredients (being sure to drain your cashews and leave cooked brown rice out) to a large pot and blend until smooth. Then heat to desired temperature. If using high-powered blender, add all ingredients (except for cooked brown rice) to blender, blend on high until smooth. Then moving blended mixture to a pot and heat to desired temperature. 3. Place a small scoop of cooked brown rice in the bottom of the serving bowl, and add soup over top. Enjoy!